Carnatica and Sri Parthasarathy Swami Sabha organise Bharat SangeetUtsav every year in November ushering the 'December' season. Interesting thematic concerts form part of this 8-day festival. This year the concerts are held in support of Vidya Sagar in aid of persons with multiple disabilities. 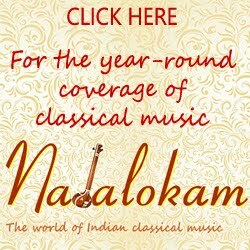 7.00 p.m. - Carnatic Pattimanram - Sangeethathin menmaikku peridhum karanam - Kalaignanaa? Rasikanaa? 7.00 p.m. - GrooVIDa - the newest ensemble of Musicians. 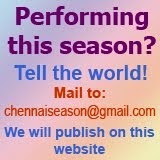 Best wishes to the program -- Great artists and variety of concerts- Wish I am in India to attend.